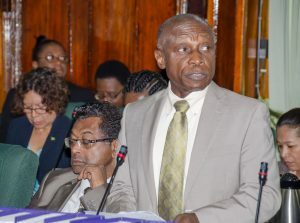 Guyana wants to be erased from European and United States money laundering blacklists, saying there is no evidence to support such labels because the anti-money laws have been tightened Foreign Minister Carl Greenidge. “When you consider the other people on the list, it is really absurd that Guyana could find its way on a list of five countries that are blacklisted in the context of money laundering, however bad the opposition may have been. Our impact and influence internationally can only be small and whilst it is true that the previous government was accused of harbouring, facilitating and doing a whole set of things that helped money laundering and the like, we have not been fingered in any way in relation to terrorism to any significant or meaningful extent,” he told a news conference. The European Parliament has rejected a recommendation by the European Commission to replace Guyana with Ethiopia as among the 11 countries that have strategic deficiencies in their anti-money laundering and countering the financing of terrorism regimes. The 10 other countries are Afghanistan, Bosnia and Herzegovina. Iraq. Lao PDR, Syria, Uganda, Vanuatu, Yemen and Iran. In that regard, the Guyanese Foreign Minister said his country’s oversight mechanism for removing political influence in the appointment of the Financial Intelligence Unit (FIU) came into being in 2015. The European Parliament has said the EU should have an independent, autonomous process for judging whether countries pose a threat of financial criminality rather than relying on the judgement of an external body. The Foreign Minister said Guyana has already done enough to prove its case beyond the talk of merely rejecting the US and EU’s stance. Based on reviews by the Financial Action Task Force (FATF) dating back to 2009, reports had been compiled, but Guyana had not implemented recommendations to deal with criminalisation of certain activities, and the seizure of assets. Greenidge suggested that it was ironic that the FATF has removed Guyana from scrutiny before 2015 and 2016, but the Europeans who are active participants of that France-based international financial crimes watchdog are now blacklisting Guyana. “You can’t be at one time the member of body governing world affairs and at the same time seeking to enforce on other people additional criteria which you can’t get acceptance of or you never even out to the world body of which you are member,” the Foreign Minister said. While efforts continue to have Guyana removed from the list, he said EU officials have assured that “we would not be damaged in the interim.” Guyana’s embassy in Brussels has been mandated to provide support and follow-up work. He said reports are being submitted to the FIU, FIU oversight and staffing, the submission of reports by that entity, and going after perpetrators. The regulatory agency, he said, has been receiving information from banks with international assistance. Asked whether Guyana has hard data to prove that dirty money is not being passed through Guyana’s financial system, Greenidge said not even the US could do that but that country monitors and enforces the law even to the extent of blacklisting financial criminals from business activities. The Foreign Minister could not say with absolute confidence that multi-million dollar contracts have been awarded by the National Procurement and Tender Administration Board and more recently the Public Procurement Commission have to anyone who was allegedly involved in money laundering. “We can’t say to you that no contract since the legislation was passed has been awarded to persons who had been involved in irregularities,” he said, adding that precautions are taken to prevent that from happening. If it does, he said, police and other parties would be called in. More than two years ago, a Guyanese businessman, who had been investigated by the US for money laundering, had been awarded a contract to supply several excavators to government. The anti-money laundering and countering of financing terrorism refers to the process of layering of proceeds from crime through a chain in which several parties may be deemed culpable.